Very proud to offer the most beautiful puppies for sale. 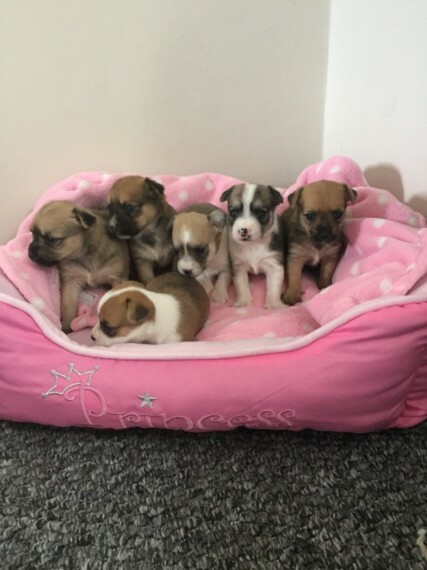 I have 6 morkie cross chihuahua babies 3 boys 3 girls. born to our family pet morkie .Maltese.yorkie mix. and the father is a stunning blonde long coated chihuahua lovely little dogs. Puppies are raised in our family home and very well socialised with kids. these little bundles of joy will Melt anybody that meets them they are amazing.cheeky. playful and absoloutly gorgeous. Viewing can be arranged but they will not leave home until 8wks old. Pups will be fully health checked microchipped. flead and wormed will also leave with a full puppy pack with info on care and plenty goodies to spoil your little one. Please before calling or texting take into account the lifetime commitment of a dog. as I will only allow these little babies to go to genuine forever loving homes. Deposit of 150 on viewing will secure your pup. Boys. 650 Girls . 750 Thanks for taking the time to read please call or text as emails not always received straight away.